This is a great little rainy day project that's perfect for teens-- a fun way to spend the afternoon. 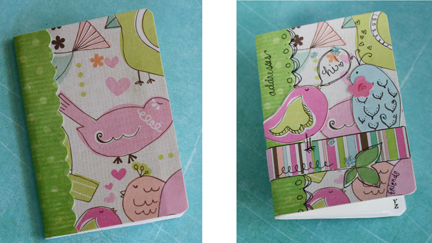 I found these cute mini address books at Hobby Lobby for $2 just begging to be cute-ified! Have fun crafting it up! The covers of the books have plastic-coating which doesn't like to stay glued to paper, so you'll need to peel that off first-- just the top layer, not the whole cover. 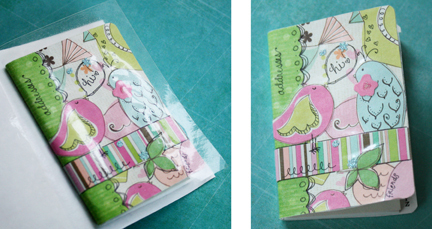 Now you can cover your book with a cute paper of your choice. Then, set your little book under a heavy one for a bit while it dries. After that, it's all up to you! I cut a strip of patterned paper and a few birds and leaves from the cover paper and made a little collage. Then I drew a few doodles and added a little "bookplate" on the inside cover. You could use stickers, ribbon, rubber stamps or rub-ons. Look around the house for cool stuff like magazine clippings, postage stamps and candy wrappers. It's a great way to reuse and recycle, plus it doesn't cost a penny! This step is optional. My address book is going in my purse, so I thought it would be a good idea to seal it so it doesn't get all crummy. Just cut a piece of the laminating sheet, stick it on your book, trim around the edges and rub it on really good with a spoon or something. Share It- Gift It- Use It! That's it! 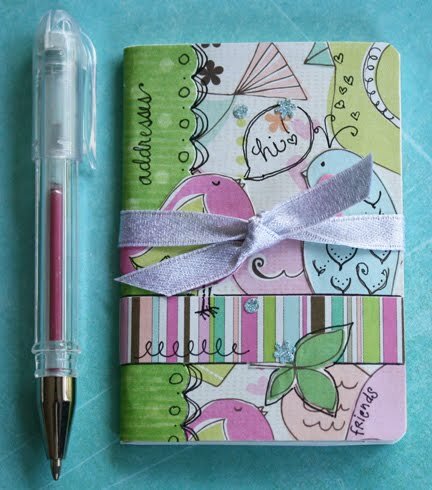 Wrap them up with a cute gel pen to give as party favors, a teacher's gift, a Secret Santa or for yourself! They would also be a fun activity for a girls slumber party. Afterward, they can pass them around and fill in their addresses and cell numbers, for emergency texting only of course (like who's crushing on who)! 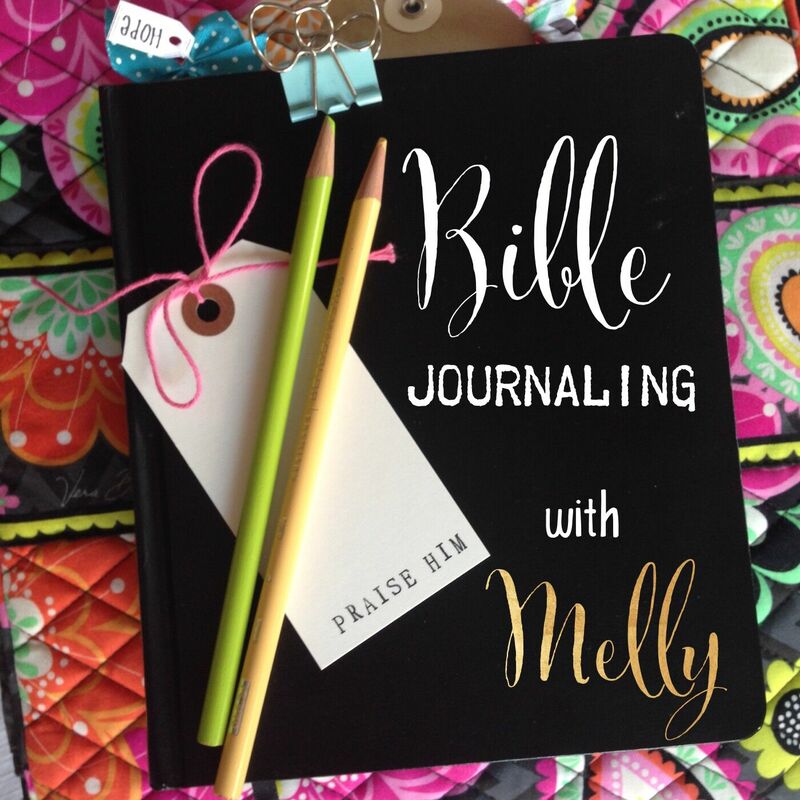 *tip-- Hobby Lobby only keeps a few address books in stock at once, so if you plan to make several to give as gifts or need a bunch for a group activity, you can purchase larger quantities in packs of 12 here. ***Update-- it looks like the address books aren't available on the office supply website any longer. Try these Moleskine books or these Mead books instead. 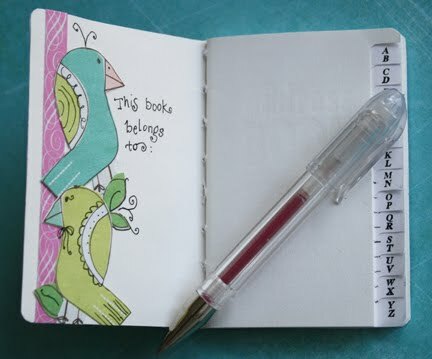 You can also use mini composition books which are super cute. what a great idea to do the spine like that! I'm going to have a go and decorate normal notebooks like that. Moleskin books and sketch books would be fun gifts! I love covering books; I've done it for little sketchbooks that had the ugliest cover, but were super cheap and used them for party favors!